Why does a smart young man decide to enter the gutter installing, window installing, roofing and siding business? Becasue he is a smart young man. Jimmy Vensel has always done his best at everything he has done. He played Rugby at Western University as a student. His plan was to study commercial design at school but began his career in hotel restaurant management. But in 1998 he could see that his future was in the gutter business. Like many in this business, his first job was cleaning gutters He borrowed a ladder from his family and was paid !00.00 to clean the gutters of a family friend. He completed the job in 20 minutes and it was perfect. He had been bitten by the "gutter cleaning bug". After one job he started advertising. It worked. He got lots of jobs. Now he advertises in Christian newspapers and also purchases advertisements in various phone books is moving toward digital advertising. From guttter, he expanded to roofs, siding and now windows. He is a true believer in "researched targeted advertising". His company has received many awards for excellence in his industry. Jimmy is dedicated to his work and even more to his family. Even though he works hard to provide a good living for his family, he works even harder to be the best husband and father any man could be. It is not easy, but the expression "nothing worth doing is easy" applies to the life of Jimmy Vensel. 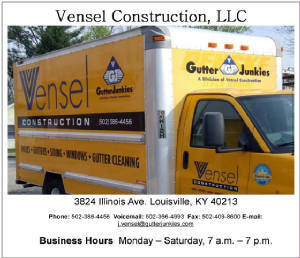 Click the graphic to the right and visit Vensel's website for more info about Jimmy's company.